As I’ve blogged before, I have an obscene collection of dinnerware. Some I have because they are pretty, others because they were too good of a deal to pass up, others are very sentimental usually for family reasons. One of my favorite patterns ever is Homer Laughlin’s Golden Wheat. Some of the pieces were given away as premiums in laundry soap, and that is how Mom got her Golden Wheat dishes. We ate off them daily, along with Starburst by Creative China (subject for a future post!). I have a lot of fond memories associated with that pattern, so I started collecting it. I’m on a mission to have a complete set someday! I love this set so much, it is the Official Thanksgiving China here at The Sisters. Thanksgiving is my favorite holiday and I always associate it with family. 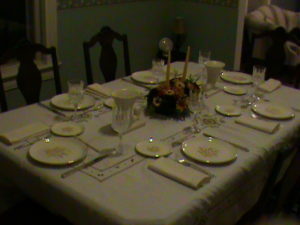 So, I love to pair the china with Great Grandma’s Coronation flatware, bringing more family to the table. This picture is from 2011 and is not the greatest; again, I did not own a digital camera at the time so I used the camera feature on my camcorder, which is not good. I used Longchamp red wine stems by Cris d’Arques, and the ivory cornucopia vases I had purchased at the one and only Christmas At The Mansion annual gala event at the Conrad Mansion in Kalispell, Montana earlier that year. I fell in love with them and just had to use them on my table that year! The tablecloth is very special. It was hand stitched by Harriet Thackeray Lucke and was given to me by her grandson, Lou, because “if you don’t want it, I’ll cut it up and use it for rags.” Guess what came home with me? The flowers were a hostess gift from my mother. It was a grand and happy Thanksgiving meal!